Melissas.com. What do you put on your grilled meat? Ketchup? Mustard? Steak sauce? Worcestershire? Today’s tip is a delicious make-your-own condiment, red onion marmalade. It is an addictively good finishing touch to lamb, poultry, pork, steak or anything from the grill, including pizza. No other condiment is needed. You can also serve it with breakfast eggs, on toast and on sandwiches—try it with grilled cheese. The marmalade is so good, you’ll be sorry you didn’t make four times the amount. And you can give it as gifts. This recipe is courtesy Melissas.com, an unbeatable resource for gourmet produce and healthy gifts. The difference between onion marmalade and caramelized onions is the added brown sugar, vinegar and wine. 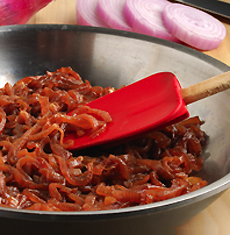 You may also enjoy this recipe for caramelized onions. 1. Melt the butter in a medium pan. 2. Add the onions and sugar and cook over a medium heat, stirring until soft and lightly caramelized. 3. Add the wine and vinegar and let cook for about another 10 minutes until all the liquid has evaporated and the onions are very soft. Season with salt and pepper. Serve over beef, chicken, lamb, pork or tofu. 4. Store leftovers in an airtight jar and use within two weeks. Marmalade is a soft jelly, often citrus-based, that includes the flesh and often the peel of the fruit suspended throughout the jelly base. The sweetness of the jelly is offset by the bitterness of the peel. Some products and recipes that are called marmalade—onion and tomato marmalades, for example—are actually misnamed jams and preserves. Why? Perhaps because onion marmalade sounds tastier than onion preserves.